Kurghinian’s comeback: 100 years before or later, what difference does it make? Those graduating from a Soviet school remember Shushanik Kurghinian’s “Laborers” poem that was learned by heart by pupils. Now there is no Soviet Union, and as it disappeared Kurghinian was also erased from the school curriculum. Today, when you ask a teenager – have you studied Kurghinian, he answers – who is she? The name of Shushanik Kurghinian remains only in the memory of older generations as a trace of Soviet propaganda, as a proletarian poetess. 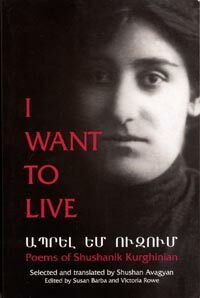 But there is also another Kurghinian, who is much more advanced than the idea of a woman in today’s Armenian reality: a feminist and rebel poetess to whose readers the book “I Want to Live” is returning. Shushan Avagyan, a 30-year-old Illinois University doctoral student has translated Kurghinian’s work, published by the Armenian International Women’s Association (http://www.aiwa-net.org). The collection “I Want to Live” returns not only Kurghinian, but also the territory she had gained for women where a woman’s life is not for pleasing a man and continuing his generation. With bodies full of vigor. Kurghinian (1876-1927), was born in Gyumri. In 1903 she fled to Rostov hiding from czarist persecutions. Later she returned to Gyumri. The rebellious female spirit disappeared together with Kurghinian. The Soviet Union reduced the ideas of equality and liberty to slogans that were not applied other than on the banners during parades, and behind the banner there was a woman burdened with family cares who had to cook, washed dishes and did the laundry, cleaned the house after having to work outside. March 8th, which was determined as the day of women’s struggle for emancipation, was turned into a festival of paying attention to the woman that even more accentuated the social division between women and men. The country broke up, March 8th remained a festival. Now was revitalized the pre-modern patriarchal thinking in which a woman, as an actress on TV says, is a complement to a man. Kurghinian’s book seems to have appeared to dispute lingering ideas and charming female leaders existing (as in today’s Armenia) on grants. Do not love me as if I were a flower! as a child of the street mobs! The link between generations has been severed, the foundations of society laid down by the intellectual spirit in the early 20th century have collapsed. Now the role given to the woman to raise a child and keep the sacredness of the home is not even disputed. A woman’s career begins when she gets married and ends with raising her grandchildren. And again the link is restored, lines appear that are put before a woman like a mirror. Of being born a girl. For having hearts that are tainted with deceit. Dozens of seminars are held during a year dealing with women’s emancipation and gender issues. Speakers present the international experience of women’s movements. Where is the Armenian experience? It seems it never existed, it seems that from the Middle Ages Armenia at once appeared in the 21st century.